McKie, speaking at a press conference last Friday, said that there have been repeated calls for improvements to facilities for local athletes. âGenerally to this, I want to say that the Ministry is also concerned with this fact that we need to have this improvement,â McKie said. 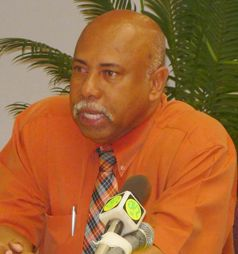 He said that work has been done to some facilities throughout the country, one such being the Arnos Vale Playing Field. But, according to McKie, although Arnos Vale is regarded as one of the best facilities for football and cricket in the region, and although athletes continue to improve as is evident with the number of records that continue to be broken every year, the local track and field athletes need access to a synthetic surface. âIn terms of track and field, it (Arnos Vale Playing Field) is a grass track without a sound base and although athletes have been improvingâ¦we also have to look at providing a synthetic surface for the athletes to perform better and improve on their times,â McKie said. The Minister said this is why his ministry is moving forward with the first phase of the stadium project. Already proposals have been sent to a number of organizations, including footballâs world governing body, FIFA, and discussions have been held with the local athletic body, Team Athletics SVG.